In the battle between cablecos and telcos, Comcast seems to be advancing the arms race nicely. For months I have noticed that most downloads have been zippier at boosts up to 8 Mbit/s, but lately I have seen jumps over 10 Mbit/s. This note on Broadband Reports prompted me to test my speed again. 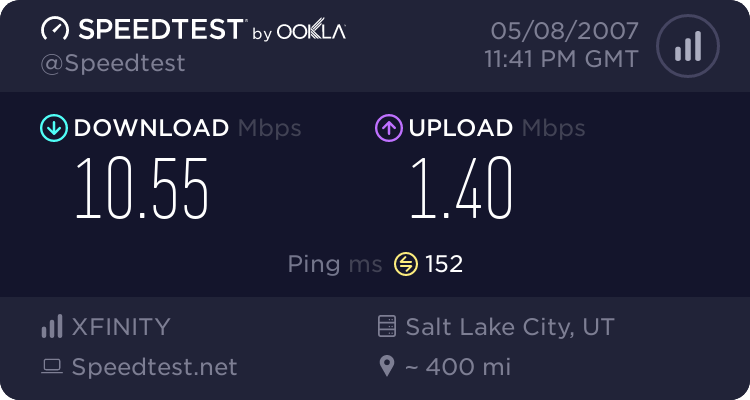 As noted in the graphic above, I receive Ethernet speeds for short periods of time for downloads and almost a T1 in the upstream direction. With DOCSIS 3.0 on the way, how long will it be before we see 100 Mbit/s? No wonder why cable has captured over 70% of the VoIP business and is a serious threat to the telcos. A common inbox for e-mail, voicemail, and IM may win me over from my VoIP provider that has not introduced anything new since E911. Although it may be a duopoloy in most communities, the cable companies are serious about being your triple-play provider.